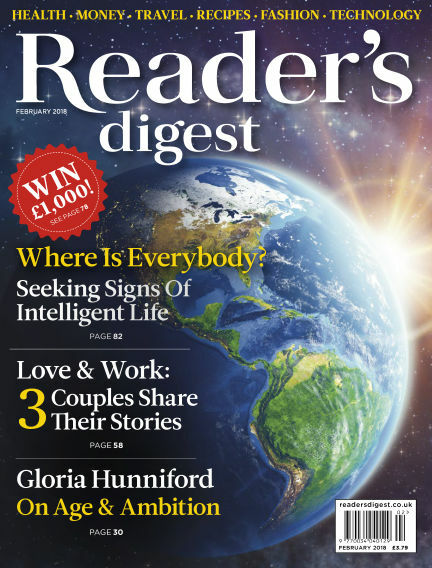 In this issue of Reader's Digest UK : Reader’s Digest lets you browse smart, useful tips on health, work, food, relationships, home, and money, all expertly selected from hundreds of online and print sources. You’ll discover original profiles of inspiring people, real-life dramas, insightful essays, and news roundups that get you up-to-date fast on the issues you care about. With Readly you can read Reader's Digest UK (issue February 2018) and thousands of other magazines on your tablet and smartphone. Get access to all with just one subscription. New releases and back issues – all included.